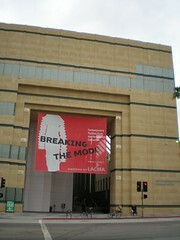 Los Angeles County Museum of ArtOriginally uploaded by tazacacao. Thàinig cairt-bhallrachd agam LACMA anns a’ phost an-dè. ‘Se taigh-tasgaidh mòr a th’ann, agus tha e air suidheachadh air Wilshire Boulevard ri toabh làraich ainmeil na Tar Pits LaBrea. Fhuair mi a’ bhallrachd fad ’s a bha taisbeanadh dealbhan le David Hockney ann. ‘Sann saor do bhuill tha ticeadan thaisbeanaidh, agus gheibh mi ticeadan nuair a thoisicheas taisbeanadh Magritte ann an ùine ghoirid. Tha tachartasan eile agus filmichean gu leòr ann cuideachd. Bi mòran ri dèanamh anns a’ bhliadhna ri tighinn.